Zombie apocalypse is here. You’re the lucky one. You get in your car and you manage to get out of town. You drive until the car runs out of gas. You get out of the car and reach into your pocket. No sweat, no problem. You have your survival knife with you and you’re ready to face the world. Sounds impossible? Who cares? The point of having a survival knife is not looking forward to using it. But if the excrement hits the fan, you know you have a partner who will go the distance with you. That partner is your survival knife. We prefer a folding knife for survival knife. Yes, we understand that a full-tang fixed knife is theoretically stronger, but there are innovative folding knives out there that are almost, and for all practical purposes, just as strong. The clincher is the fact that it’s much easier to carry a folding knife with you everywhere. The best survival knife is useless if you don’t have it with you. You never know when the excrement is going to hit the fan, so you should have the survival knife with you all the time. Now, what if you know exactly when you have to go away and survive? If that’s case, you probably should buy three knives of different sizes, two rifles, one pistol, lots of ammunitions, and take all that stuff with you. You might as well bring the dog also (if you have one), since it’s always useful to have someone keep watch while you’re asleep. Just trust us on this. A folding survival knife is the way to go. We’ll show you the best ones. BlizeTec is owned by IM Quest Publishing. It’s a Canadian maker of knives and cutlery headquartered in Vancouver. The company’s business model is direct sales. 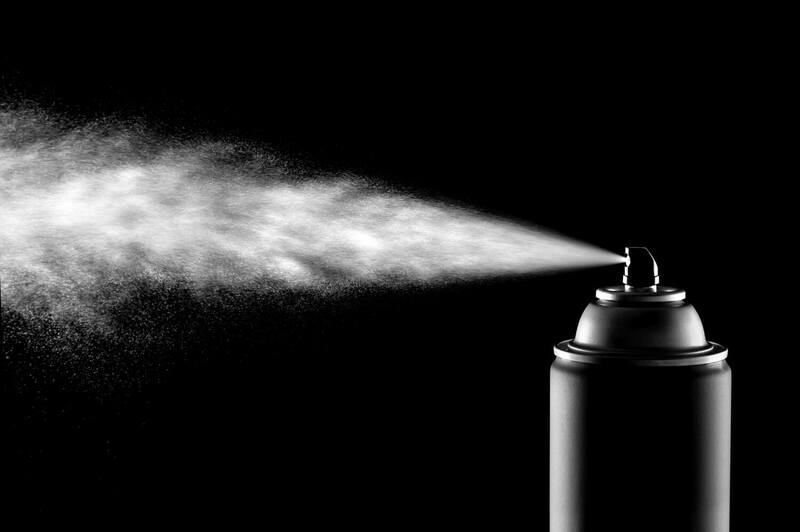 You will not find BlizeTec products at stores. You can only buy directly from them but they do sell on Amazon. The BlizeTec Survival Knife has no model number – it is known as The Survival Knife. 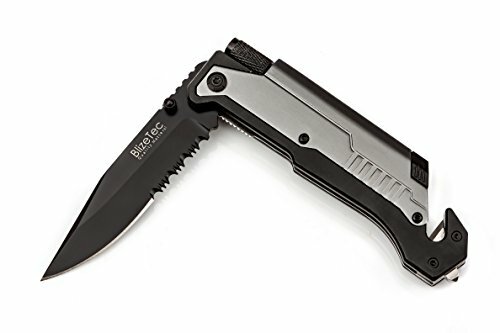 Like many knives marketed as survival knife, the BlizeTec Survival Knife is also a tactical rescue knife. Besides the blade, this 5-in-1 tactical tool is equipped with LED flashlight, magnesium alloy fire starter, window breaker, and seatbelt cutter. The blade is a stainless steel drop-point blade. It’s a strong 3.5” blade of adequate thickness. The edge and point are very sharp. It requires virtually no pressure to plunge into something. Part of the blade is serrated which is highly useful for cutting rope, wood, bones, etc. The whole thing weighs 5.46oz and measures 5” long when folded. You can really take the BlizeTec Survival Knife with you everywhere. It is backed by a lifetime warranty – how ‘bout that? The TAC Force brand is owned by Master Cutlery, an American knife maker. The TAC Force TF-705 is marketed as a tactical knife. We like it better as a survival knife and it’s easily the best deal around. This is a really striking-looking knife. It is very lightweight thanks to its skeletal design and machined aluminum handle. The blade is 3.25” stainless steel. This knife is only 4.5” long folded. 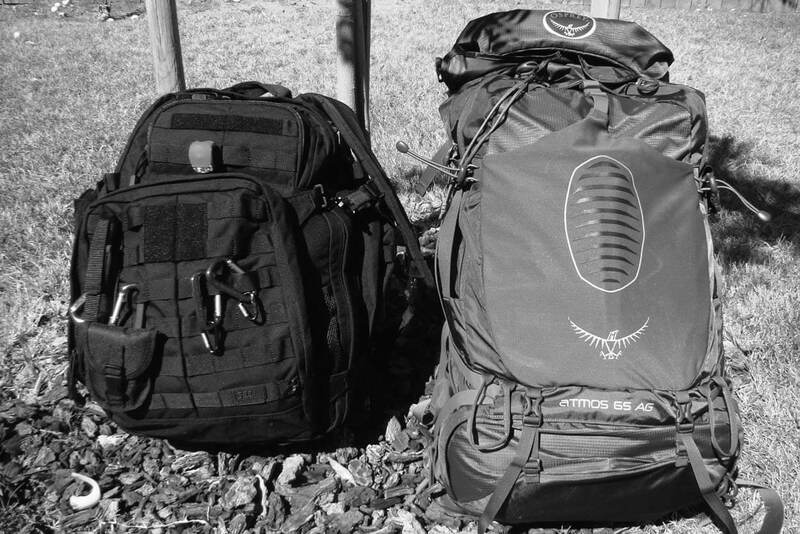 It’s easy to carry the TAC Force TF-705 around. Now, on to the good stuff. The spring-assisted opening mechanism is a peach. You can easily open this knife with one hand and the blade swings up and locks into place. The handle is equipped with a bottle opener, screwdriver, and window breaker. The blade is half serrated, though we wish it had a better serration pattern. The bottom line is: the TAC Force TF-705 is a cheap knife but a good cheap knife. It looks and works like a more expensive knife. We suggest occasional lubrication and honing to keep this knife in top condition. 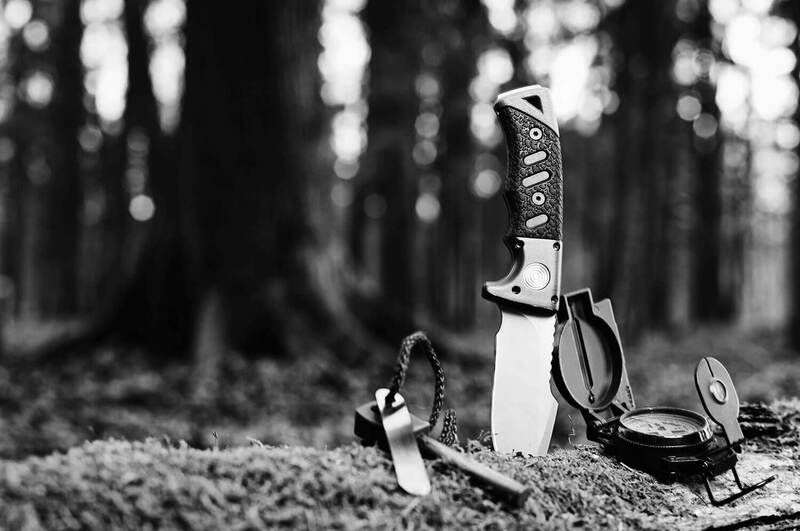 Benchmade is a top name in tactical, hunting and survival knives. It’s an American company headquartered in Oregon City. We are huge fans of the Mini Griptilian 556 as a survival knife. 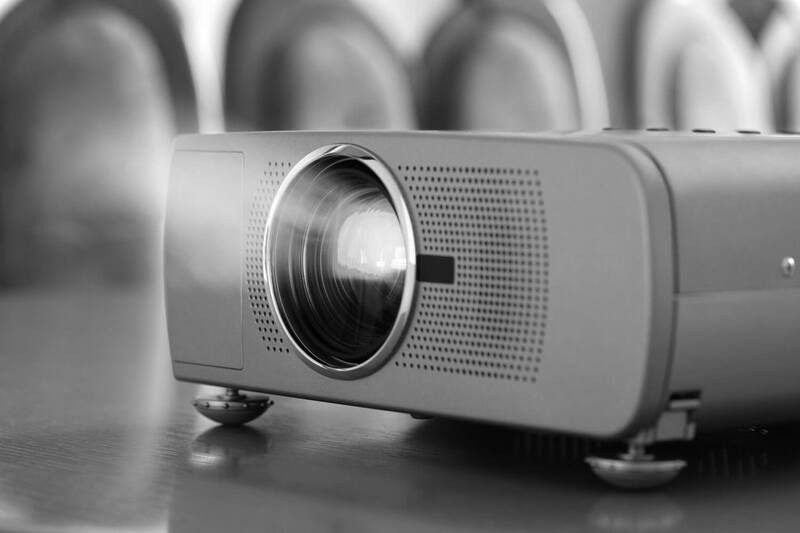 It can be custom-ordered with different steel, plain or serrated, blade style, and custom laser-marking. This is all fine and dandy but the version offered on Amazon is truly optimized for use as a survival knife. 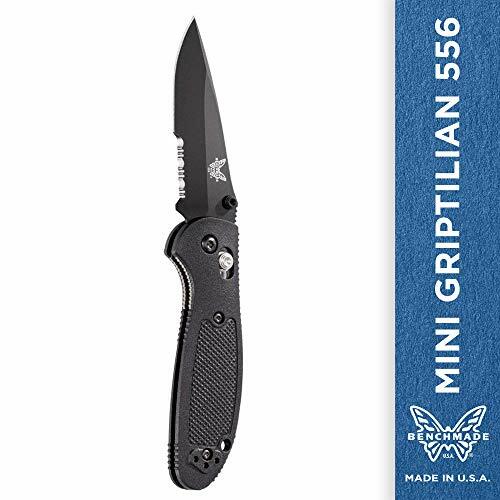 This Benchmade Mini Griptilian 556 as offered on Amazon has a partially serrated drop-point blade. The steel is 154CM American steel. The 154CM was originally formulated for making jet engine fan blades. It’s now most commonly found in higher-end knives. This steel holds the edge very well and is easy to hone and sharpen. The handle is injection-molded glass-filled nylon. This is a strong, virtually indestructible polymer that offers an excellent grip. The blade on the Benchmade Mini Griptilian 556 is only 2.91” long. The knife weighs just 2.68oz. With its perfect balance and razor-sharp edge, this knife truly inspires confidence in your hand. You’ll also love Benchmade’s AXIS locking mechanism that enables ambidextrous one-handed opening utilizing two omega-style springs. This knife is built to last a lifetime. It slices through a game with ease at the slightest pressure. You can use this knife to skin a fairly large animal much quicker than the world’s most expensive kitchen knife. This is a serious survival knife so you won’t find useless tools and features on it. All that stuff only serves to compromise a real knife. To recap, we overwhelmingly prefer folding survival knives because this is a knife that you should be able to take with you everywhere. We also prefer the maneuverability of a short blade. Remember, this is a knife for survival. It’s not for fighting a bear, but you can use the knife to make traps for one. Our pick for the best survival knife is the Benchmade Mini Griptilian 556. This knife is made to perfection. It is a serious, no-frill survival knife. If you prefer one that can also serve as a tactical or rescue knife, we suggest the BlizeTec Survival Knife. 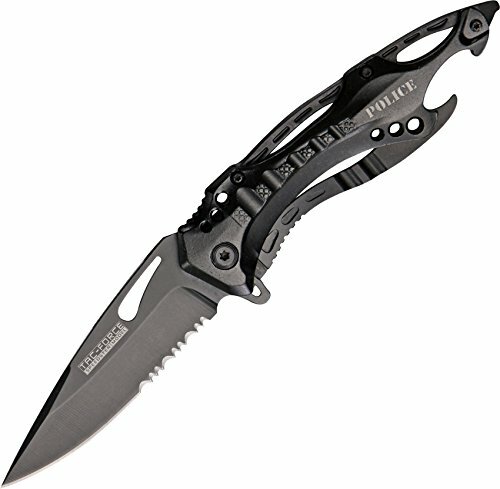 This 5-1 knife is equipped with LED light, fire starter, glass breaker, and seatbelt cutter. The absolute best survival knife in terms of value is the TAC Force TF-705. It’s a perennial best-seller for its affordability, less than $10 as of this writing.